Edibles are an awesome way to consume cannabis, whether for recreation or medical purposes. Edibles are yummy treats infused with marijuana, that deliver the medicinal and psychoactive ingredients to your system without having to smoke anything. Edibles can take the form of anything from brownies to borscht, with the help of infused oils like cannabutter. You can make savory cannabis foods like spaghetti, sweet treats like cookies and candies, or even drinks like cocktails and marijuana tea. If you want to get started making your own edibles at home but do not know how, don’t worry – there is a cannabis cookbook out there for you! In this list we will go over our top 10 favorite edibles cookbooks, featuring recipes for all tastes, budgets, and skill levels. You will find omnivorous and vegan treats, sweet and savory, more involved recipes and some that take as little as five minutes to prepare. High Times Magazine is well known and definitely well loved by marijuana aficionados all over the globe. They have been reporting on cannabis culture for decades, and have become the world leader in cannabis entertainment. They even have their famous Cannabis World Cup each year, which draws thousands of enthusiasts to sample different strains and celebrate cannabis in all of its different forms. They have struck culinary gold with The Official High Times Cannabis Cookbook, which features foods from many different cultures and for all occasions, from munchies to Thanksgiving dinner. Some of the recipes include Time Warp Tamales, Sativa Shrimp Spring Rolls, Pico de Ganja Nachos and Pineapple Express Upside Down cake. This cookbook is a must have for any home chef who wants to bring cannabis to their table. Buy The Official High Times Cannabis Cookbook here. Here is a cookbook that takes the art of cooking with cannabis to a whole new level of skill and mastery. Written by the authors of The Stoner’s Cookbook, Parks and Wolf definitely have a professional level understanding of the perfect dishes to cook with cannabis. This book covers the whole spectrum of recipes and includes gorgeous photographs of each dish. It is well written and very highly reviewed, as would be expected from the people behind the most active online community in the cannabis industry today. Buy Herb: Mastering the Art of Cooking with Cannabis here. This cookbook may be written by a humorous pseydonym, but the recipes inside are no joke! The Marijuana Chef is back with a full color edition of the much loved stoner cookbook. This book has been a best seller for over 10 years, with easy to follow recipes that make marijuana cooking easily accessible to anyone, regardless of skill level and experience. The author is a Le Cordon Vert trained French chef and has worked in fine dining for years. He has even worked as a personal chef for rock stars, and currently works as a consultant at a major ice cream company, which has to be every stoner’s dream job! Buy The Marijuana Chef Cookbook here. The Ganja Kitchen Revolution was written for cooks of all skill levels in the kitchen. It explores international cuisines and goes the extra mile by pairing each recipe with a specific strain of cannabis, much like you would find with fine wines or craft beers. Many different extraction methods are$18.97 detailed, including cannabutter, vegetable oils, and even nut butters. The thing that makes this cookbook really unique is the dosing chart, which allows you to find exactly the right dose while you are cooking and measuring out your cannabis infused oils. This means no more surprises and doses that you can customize for your particular needs. No more unexpected nights glued to the couch! Here is a cannabis cookbook that focuses on what most people associate with edibles – brownies, cakes and cookies! While most marijuana chefs assume that you can just take cannabutter and stick it in any recipe the same as you would regular butter or oil, you will soon find out that cannabis has a spicy and harsh flavor all its own. This can add a nice flavor and depth to some recipes, while in others it just plain tastes bad. Baked takes this into account and shows you how to make cannabis infused baked goods that taste great and look great too. There are over 60 recipes including Baked Fudge, Marshmallow Meltdown and Coco Nutty Lime Cookies, and even gluten free recipes for anyone who cannot eat wheat. Here is another cookbook focusing on sweet confections laced with cannabis, but this time taking a more high-end approach. Sweet Mary Jane was written by Karin Lazarus owner of Sweet Mary Jane bakery in boulder, Colorado. Sweet Mary Jane is one of the first legal cannabis themed bakeries in the united States, and focuses on making the highest quality and best tasking baked treats with medicinal cannabis doses in each bite. Some of the recipes that she included in this cookbook include Smashing Pumpkin White Chocolate-Pumpkin Bars, Sweet Temptation Mango Sorbet, and Chocolate Almond Delights. Buy Sweet Mary Jane here. The title of this book says it all: The Cannabis Cookbook features nearly 40 recipes written by Tim Pilcher aimed at enjoying marijuana edibles without having to smoke anything. Recipes include Stoned Starters or appetizers, Mashed Main Courses, Doped Out Desserts, Bombed Out Beverages, and even Crazy Cocktails. You will definitely find recipes to suit your tastes in this classic cookbook. It is great for newcomers or medical patients who do not have experience cooking with marijuana. With this book you will be able to expand your general cooking knowledge along with your knowledge of cooking with this special ingredient. Buy The Cannabis Cookbook here. The Vegan Stoner Cookbook is a favorite on this list, because it includes easy vegan recipes that do not take a lot of cooking knowledge to prepare. Vegans can get the short end of the stick much of the time when it comes to cannabis cooking, as most recipes fall back on the old standard cannabutter to add THC to their recipes. Of course, you can always sub vegan butter or oils, but most recipes also include meat, other dairy, or eggs as well. Instead of buying a regular cookbook and having to veganize all of the recipes, try out this easy cookbook with recipes that feature accessible ingredients and cute illustrations to go along with them. Buy The Vegan Stoner Cookbook here. Here is a book for the busy cook who does not have a lot of time to spend chopping, sautéing, and learning a bunch of complicated culinary techniques. If you don’t have a lot of skill in the kitchen and you don’t really care to learn, this is the perfect cookbook for you. You do not have to be a pro chef to cook delicious edibles. This cookbook is written by Kief Preston, host of Weekly Weed News on youtube and is part of his Time Tested Edibles series. It is easy to follow,and the recipes are delicious! Buy the Time-Tested FASTEST Edibles Cookbook here. 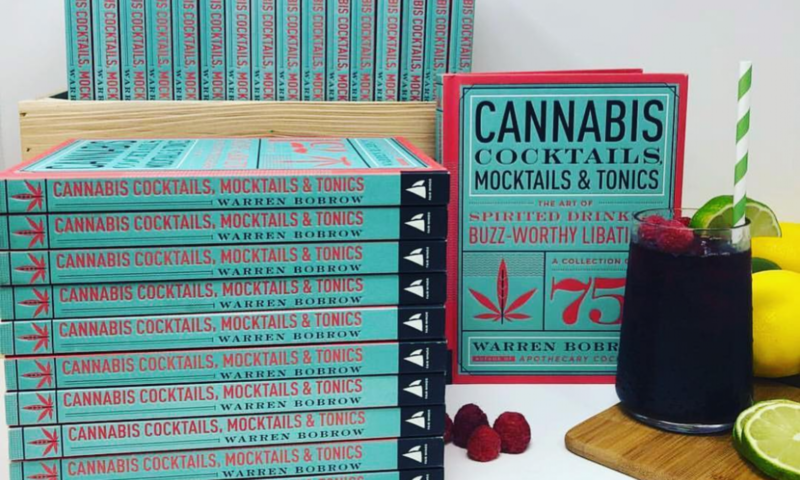 Next PostNext Cannabis Cocktails 101 with Warren Bobrow – The Manual!